Apple’s CEO Tim Cook, alongside executives Jony Ive and Phil Schiller, took to the stage today at their Cupertino headquarters to unveil the new iPhone 5c and the iPhone 5s. If you’re a frequent reader of technology blogs, you’ll notice that most of the leaked specs actually came to fruition. Normally when we are building up to an Apple product release there are several “features” that may seem a little outlandish. Often times they don’t actually pan out. In fact there were 127 rumors of Apple changing phone sizes over the years. Only one time were they actually correct. One of those rumors this year was a “finger print scanner” that would somehow be baked into the new iPhone. 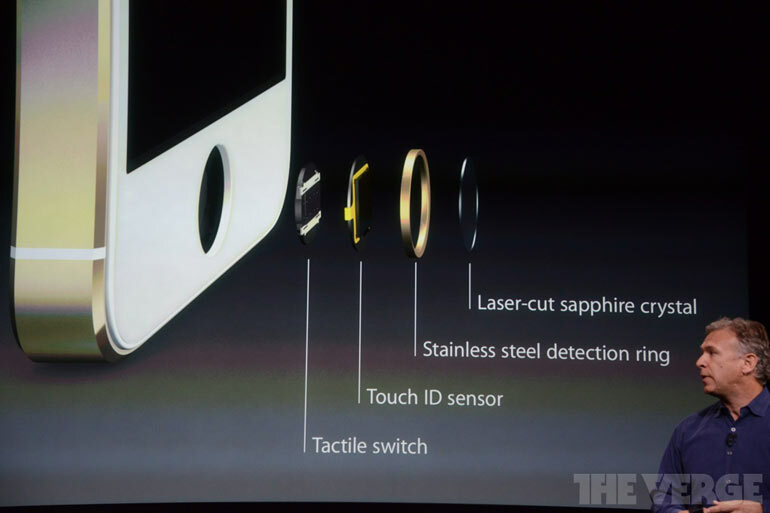 Many pundits said no-way was Apple going to put a finger print scanner on their phone. Well they have. Which actually makes a whole lot of sense after seeing leaked photos of a new home button. As you can see from TheVerge’s photo above the home button now dubs as a fingerprint scanner. When talking about it on stage, Apple execs said that it provides a new layer of security for those who feel a 4 digit code is too “cumbersome”. Of course a finger print scanner also provides an extra layer of security for people who typically use easy to guess four digit codes. The finger print scanner, dubbed “touch ID,” can work with multiple finger prints, and with any kind of human finger print it takes into account arches, loops, and whorls. CSI Las Vegas fans, you know what I’m talking about. In this generation of the iPhone, the TouchID is seen strictly as a security layer for the walled garden within your iPhone. Apple did say you will be able to use your finger print to authorize purchases from the iTunes store. They didn’t say whether you would be able to use it to validate in store purchases with the Apple store app, but that is very possible. What Schiller was very specific about, though, was that the TouchID information would not be available to other software. Period. It’s never uploaded to Apple’s servers or backed up to iCloud. The Verge’s Dieter Bohn reported in their live blog. What is possible is that Apple’s Passbook and future apps designed around security and purchasing will most likely benefit from access to the TouchID, but for now startups hoping to disrupt the mobile wallet with a tie-in to Apple’s Touch ID will find it, well, untouchable. Wait, So Co-Working Isn’t Great?